Ark Animal Health currently has 7 core development programs and studies making up our current RTX research and development pipeline. Other development programs are too early-stage to discuss. Our lead program (ARK-001) has obtained the FDA CVM (Center of Veterinary Medicine) designation equivalent to orphan drug status in humans (called MUMS — minor use/minor species). We are currently on an accelerated pathway seeking conditional approval by the end of 2018 (expected to be commercially available to treat patients with RTX by early 2019). 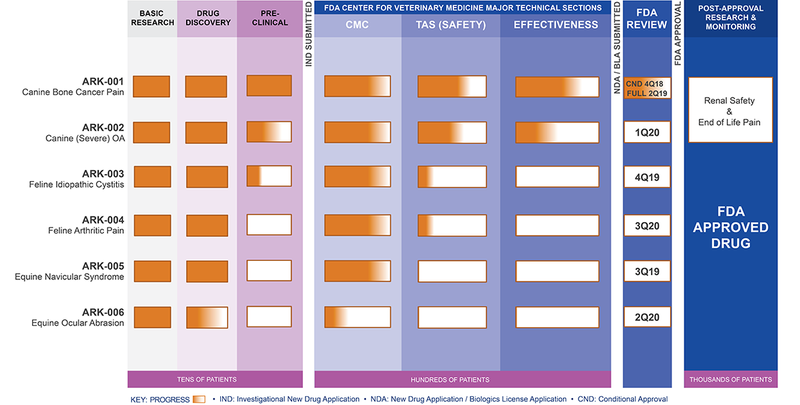 The RTX pipeline consists of seven veterinary development programs, in-market dates start early 2019 and final program concludes end of 2020. Resiniferatoxin is an interesting “pharmaceutical platform” as it has potential benefits across many species and for a diverse number of pain-triggered physiological conditions. Many indications (such as corneal ulcers in horses) would also be applicable to other species, giving a broad set of future indications to promote. We believe we are just beginning to discover how and when to use this molecule in the pursuit of giving patients more therapeutic solutions for hard-to-treat conditions.